Sunset Beach is located on the east shore of Lake Diefenbaker, just over 1 hour south of Saskatoon between the Gardiner Dam/Danielson Provincial Park and the Village of Elbow. Convenient highway access; development only 5 miles off Highway 44 or 8 miles off Highway 19. Less than 12 miles to the Village of Elbow, providing easy access to an 18 hole champion golf course, a marina & boat launch, and conveniences including groceries, restaurants, service stations, and more. 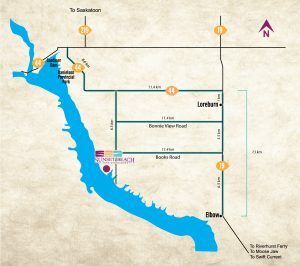 The site has been a long-time favourite, with visitors travelling from near and far to enjoy the 105+ acre space outlined by Dog Leg Coulee and Cooper Bay. The property is surrounded by two natural inlets for safe, sheltered boating, fishing, and swimming while connecting to 500 miles of shoreline with unlimited potential for fun and adventure. Visit Sunset Beach at Lake Diefenbaker on Facebook (opens new window). (Facebook user name) Sunset Beach at Lake Diefenbaker made this post. and K&D/Prime Time Drilling Inc.
Kristen, Chad & Crew your metal workmanship is super impressive- Can’t wait to install our fancy new gate system! Keep up to date with the latest updates at Prairie's Edge Developments. Frequently asked questions about Sunset Beach.